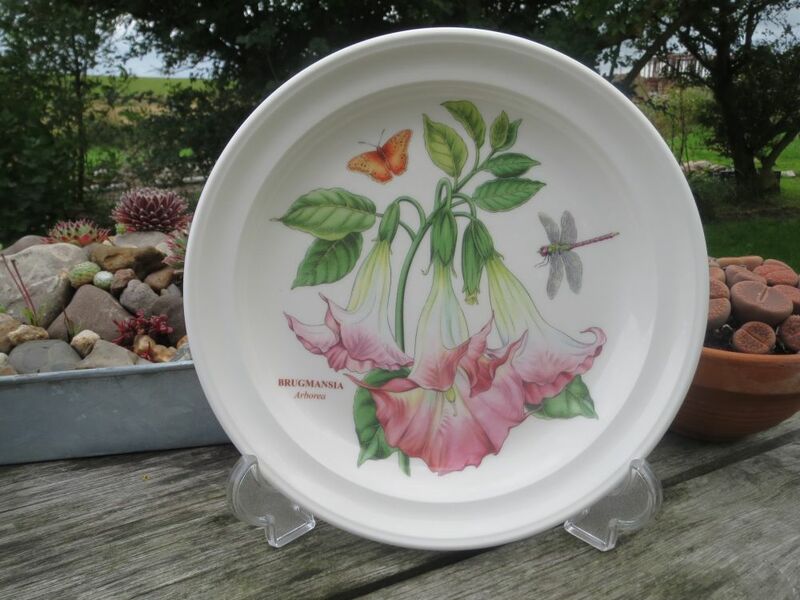 Hawaiian Hibiscus, Moth Orchid, White Waterlily,Red Ginger, Bird of Paradise, Dragonfly and Winged Passion Flower. 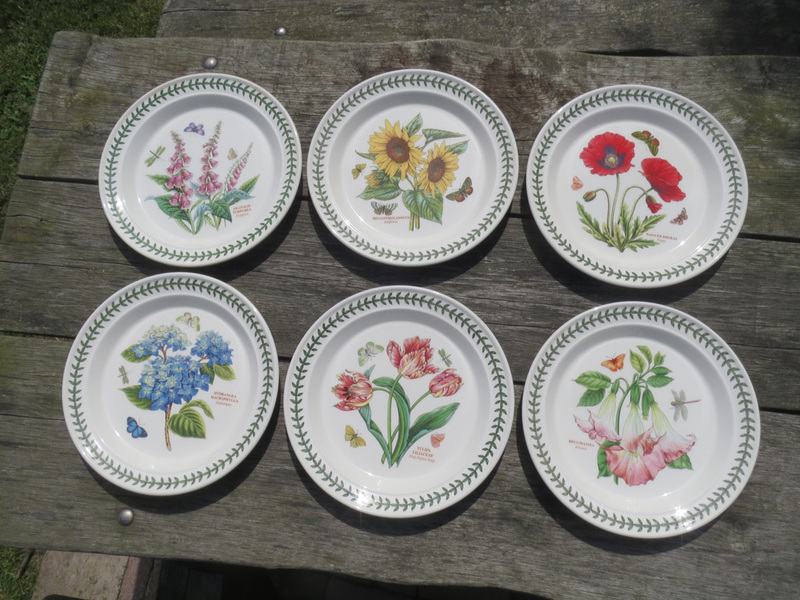 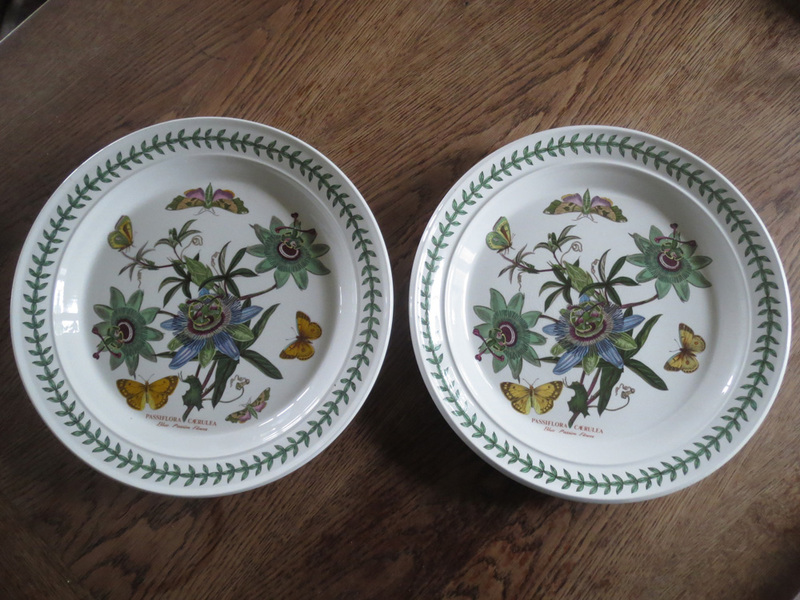 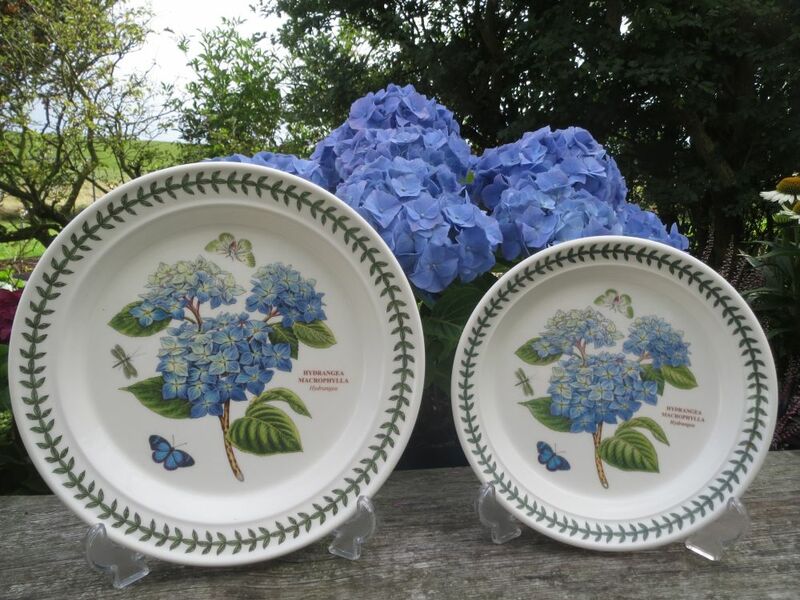 They really are an exotic lot of plates, very colourful, with lovely flowers. 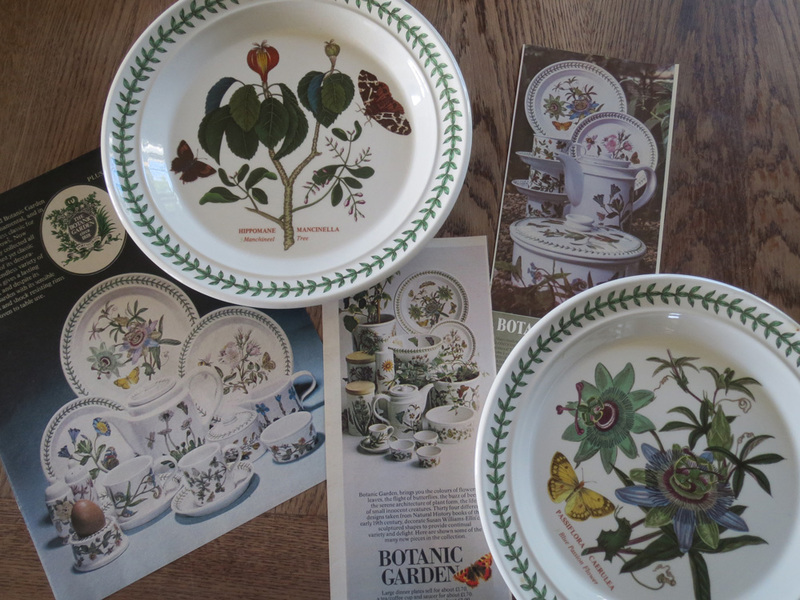 The Botanic Garden range appeared in 1972. 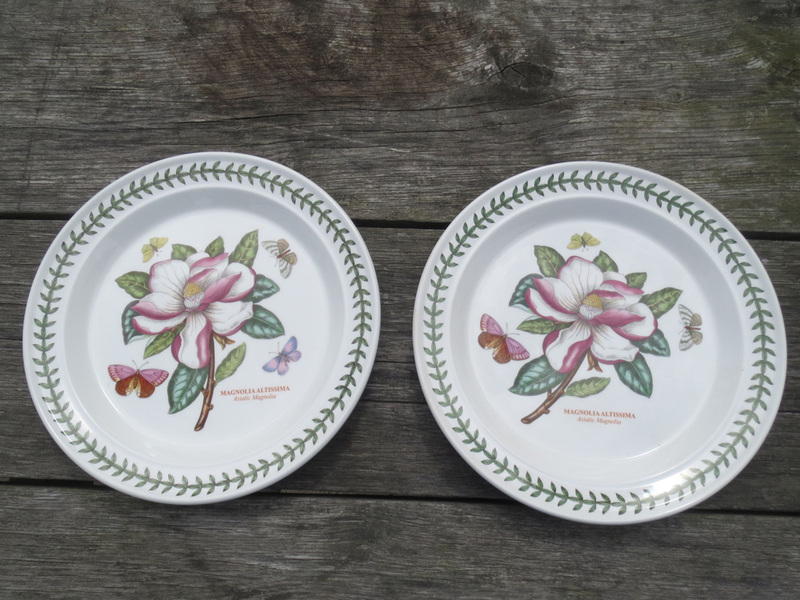 First there was a coffee set and a few months later Portmeirion proudly presented the dinner service. 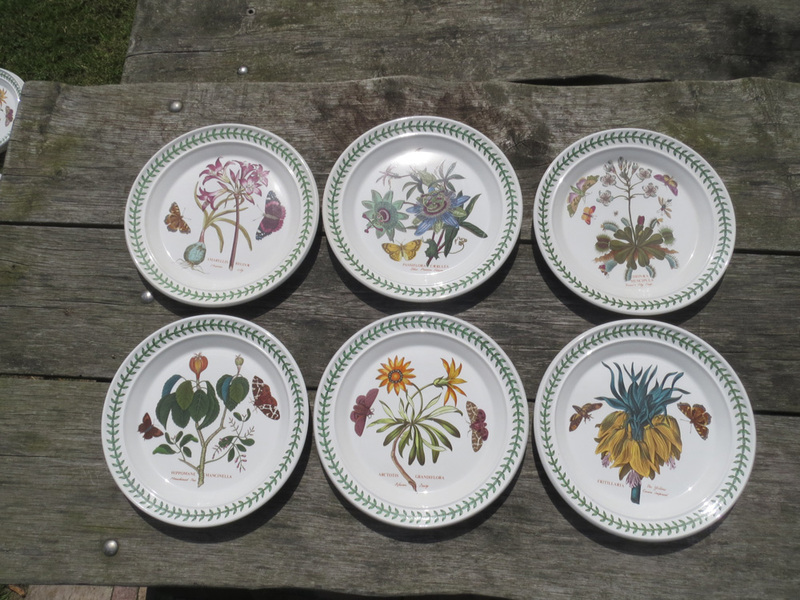 Here are the original six dinner plates: Mexican Lily, Blue Passion Flower, Venus Fly Trap, Manchineel Tree, African Daisy and Yellow Crown Imperial. 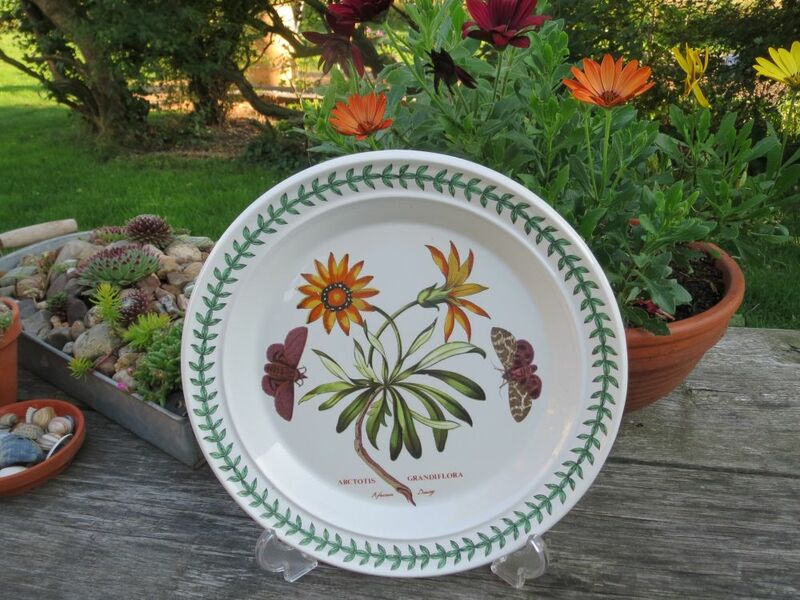 The African Daisy, here seen with some African Daisies in the background, was the first flower that Susan Williams-Ellis put on a dinner plate for the Botanic Garden dinner service. 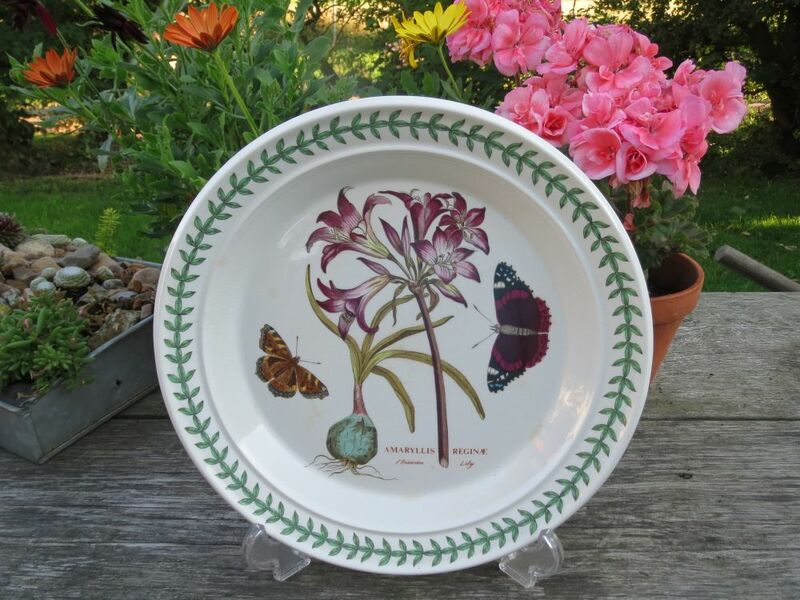 The Mexican Lily, with the dark butterflies. 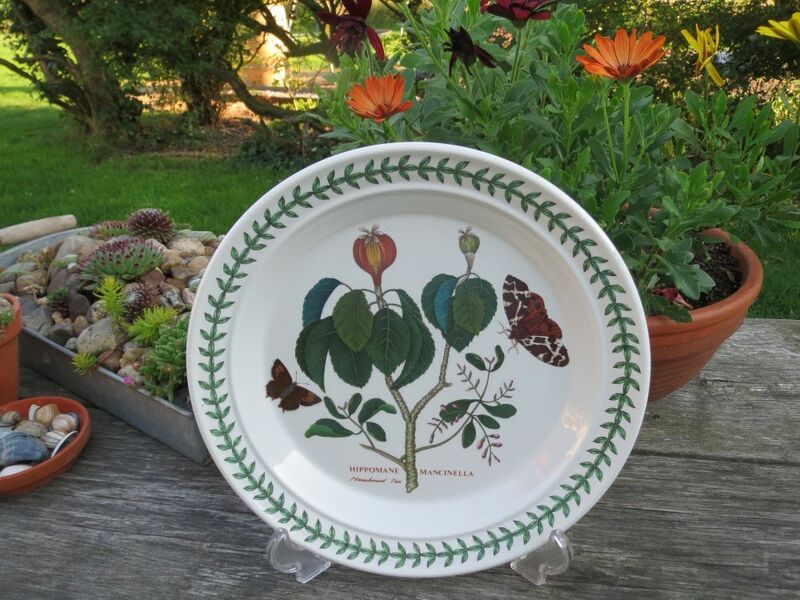 The Manchineel Tree , with the dark greens and browns. 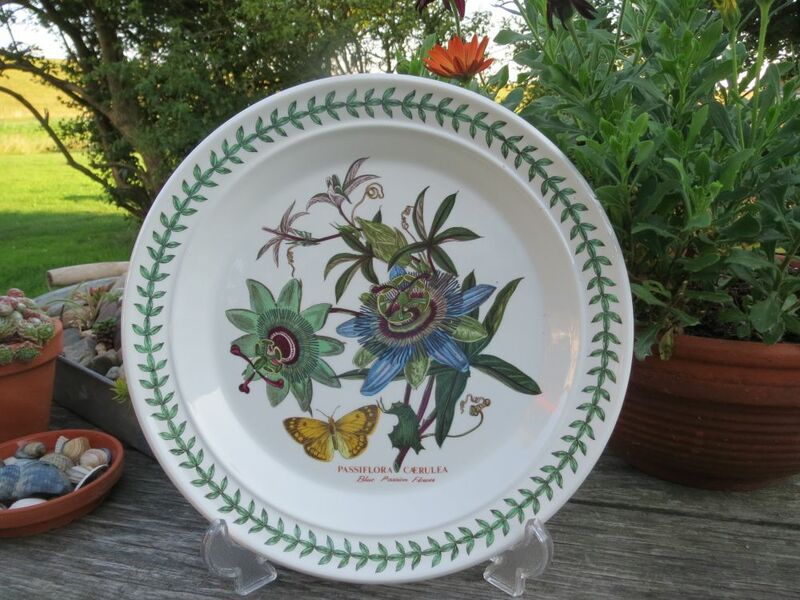 The Blue Passion Flower, a Botanic Garden classic. 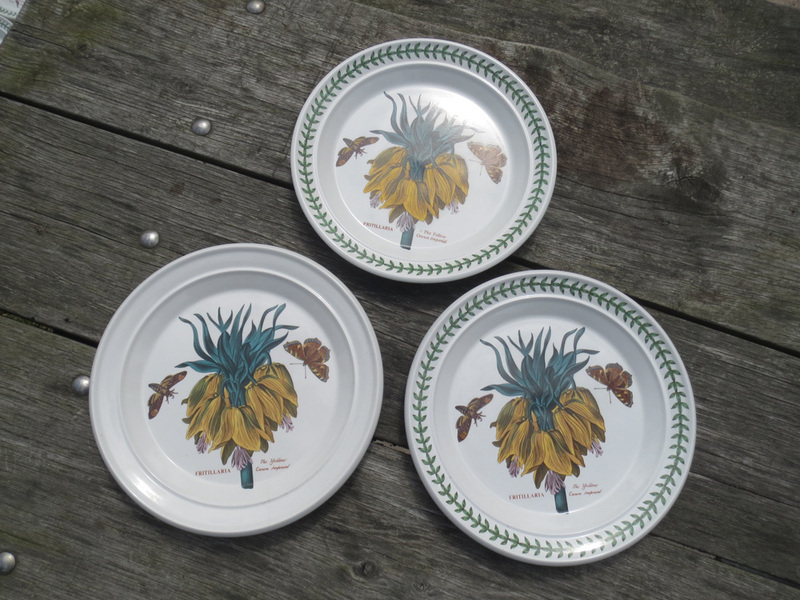 The majestic Yellow Crown Imperial. 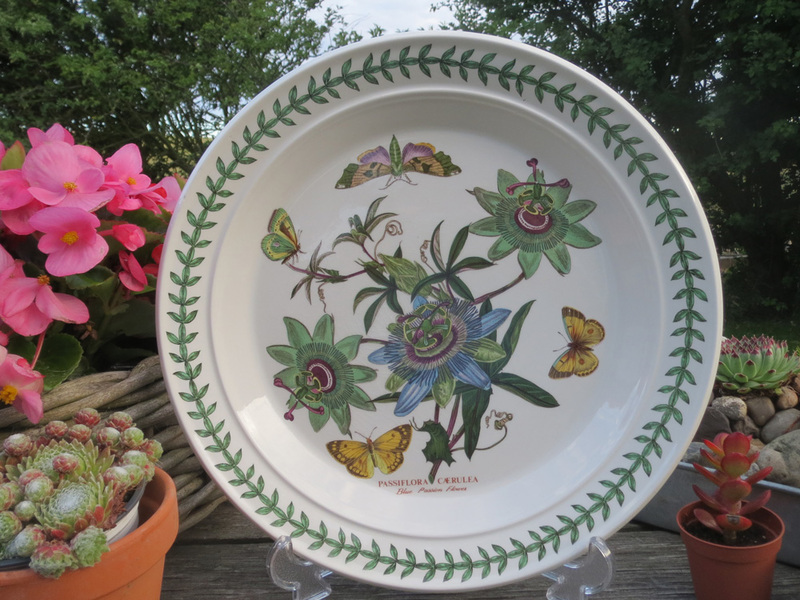 The Venus Fly Trap with the crawly insects. 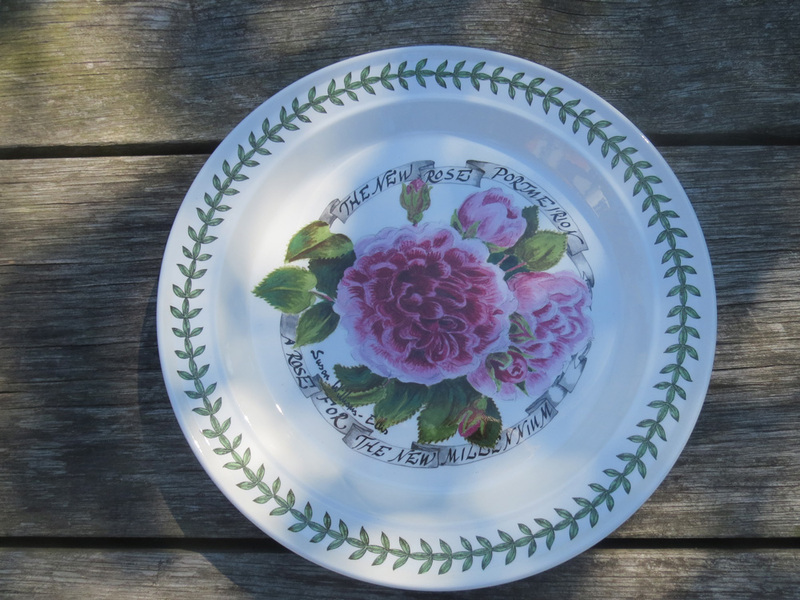 There were all sorts of variations in motifs and lettering. 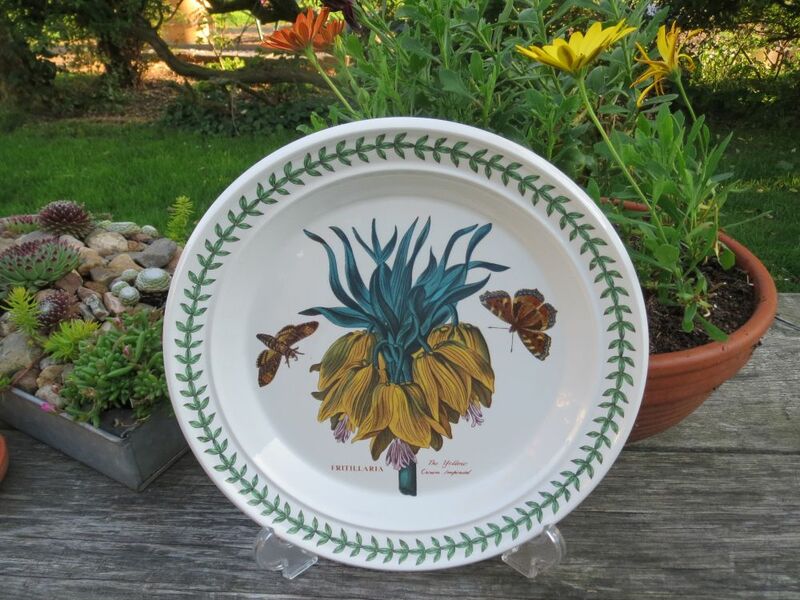 This is the Yellow Crown Imperial, with and without the green border. 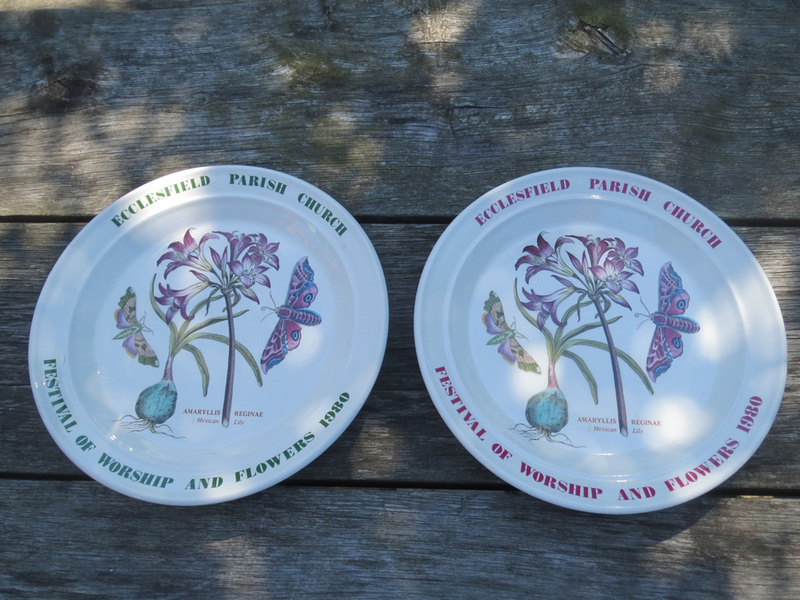 The top one has the newer lettering. 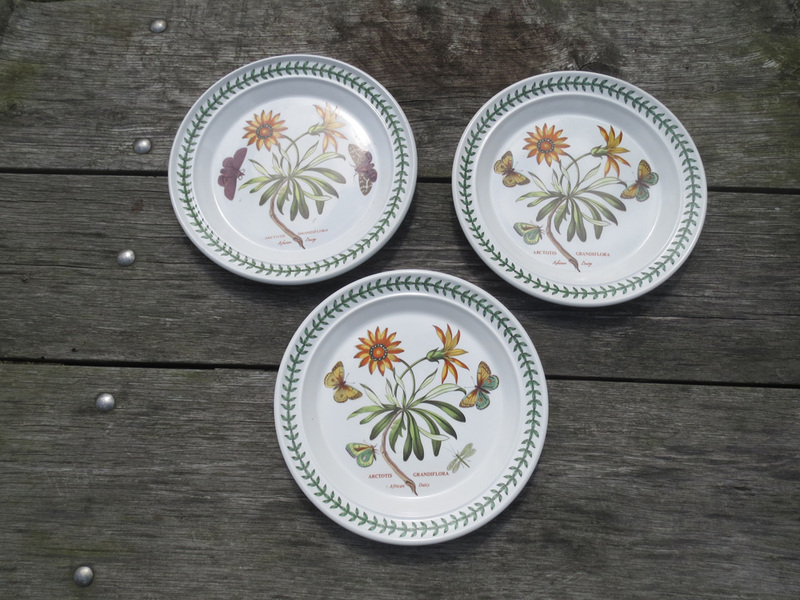 The African Daisy had an early version with brown butterflies. 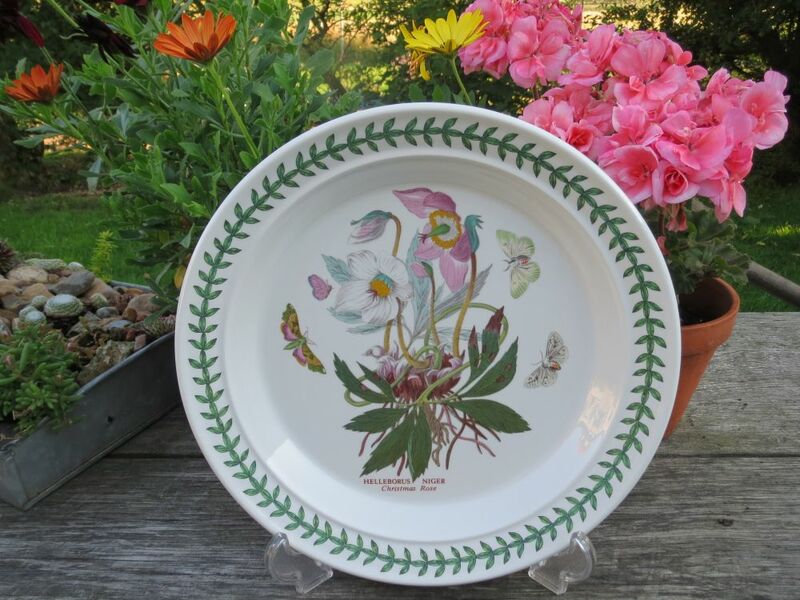 Later versions show the yellow and green butterflies, a dragonfly was also added. 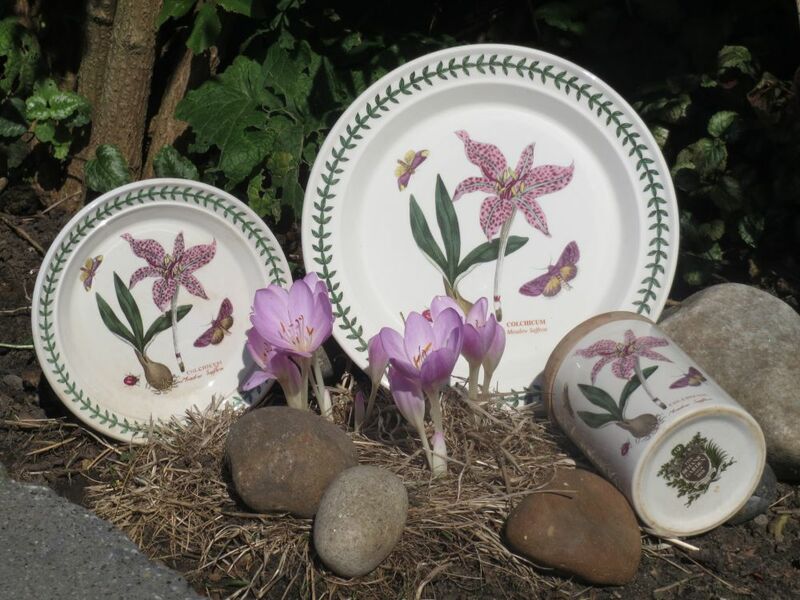 The Mexican Lily also had changes in butterflies. 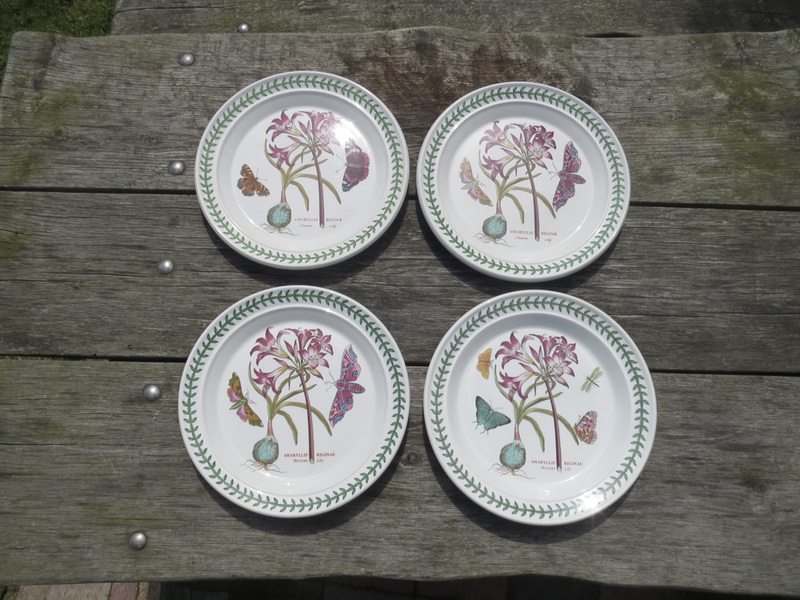 There are even three different butterfly variations, from the early dark butterflies, then the spectacular pink butterflies and finally the greenish one, matching with the bulb. 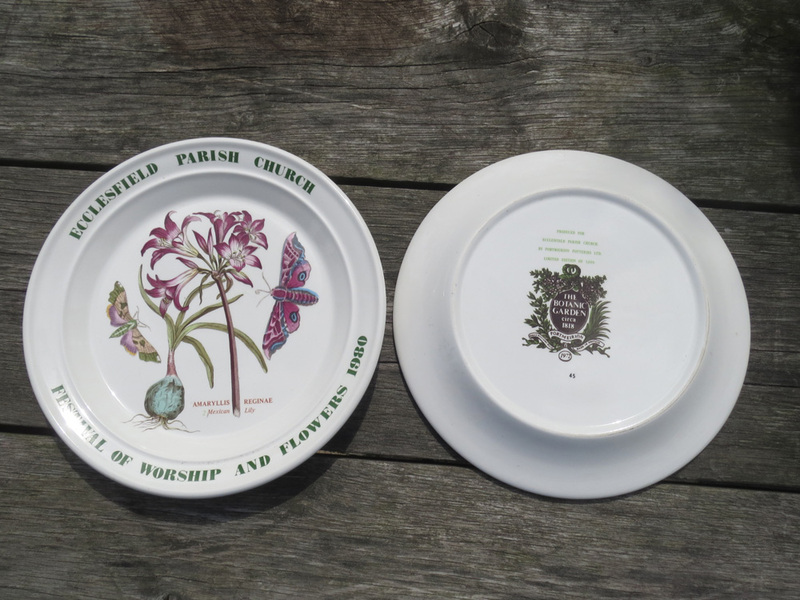 As with all the plates, the lettering changed a few times. 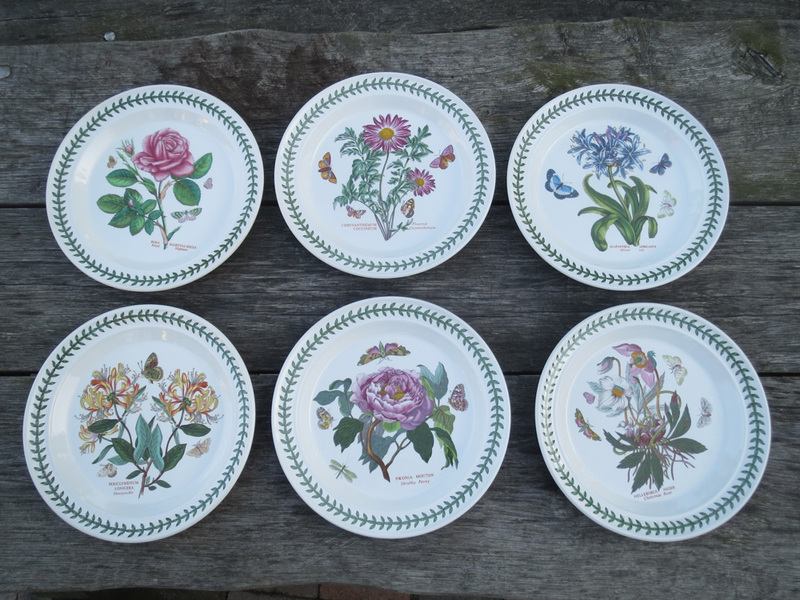 From here my pictures of the dinner plates are not all in chronological order. 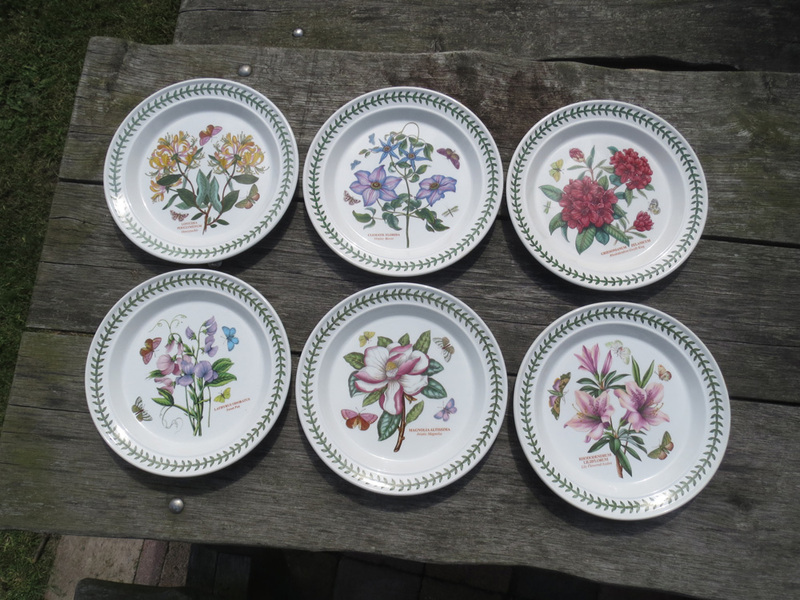 Hera are: Royal Highness, Flowered Chrysanthemum, African Lily, Honeysuckle, Shrubby Peony and Christmas Rose. 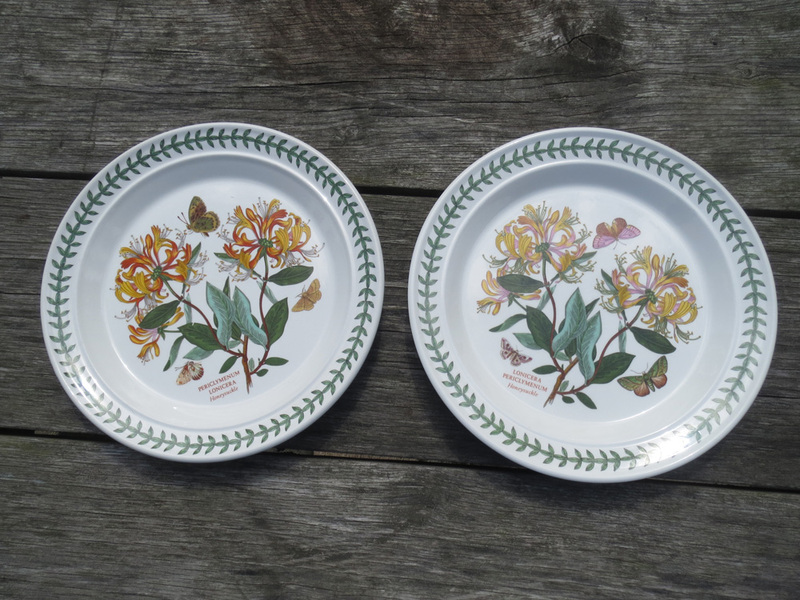 There are two versions of the Honeysuckle, the older one with sturdy brown colours, and a newer pink version. 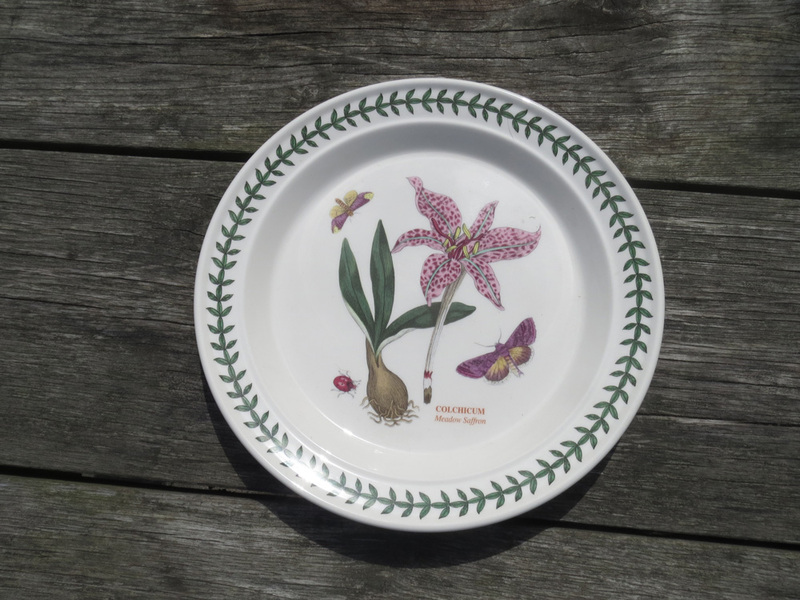 There seems to be a mix up in the Latin name as well. 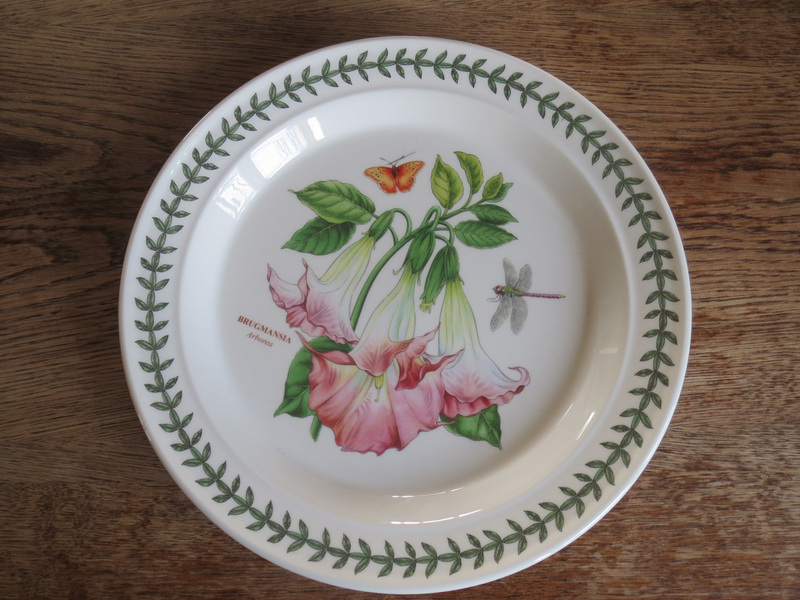 Exotic Botanic Garden is another recent range, featuring the Hawaiian Hibiscus, Moth Orchid, White Waterlily,Red Ginger, Bird of Paradise, Dragonfly and Winged Passion Flower. 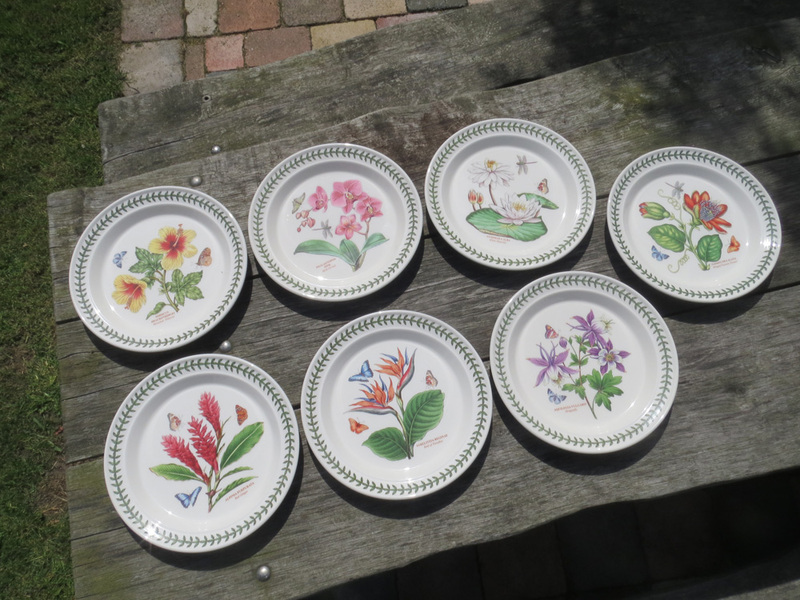 They really are an exotic lot of plates, very colourful, with lovely flowers. 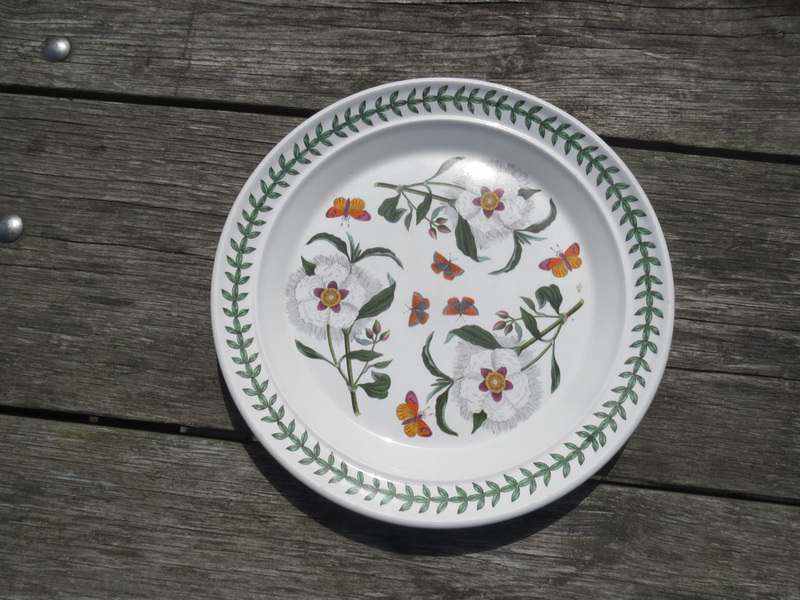 This is an older motif, the White Gum Cistus, rarely seen on dinnerplates. 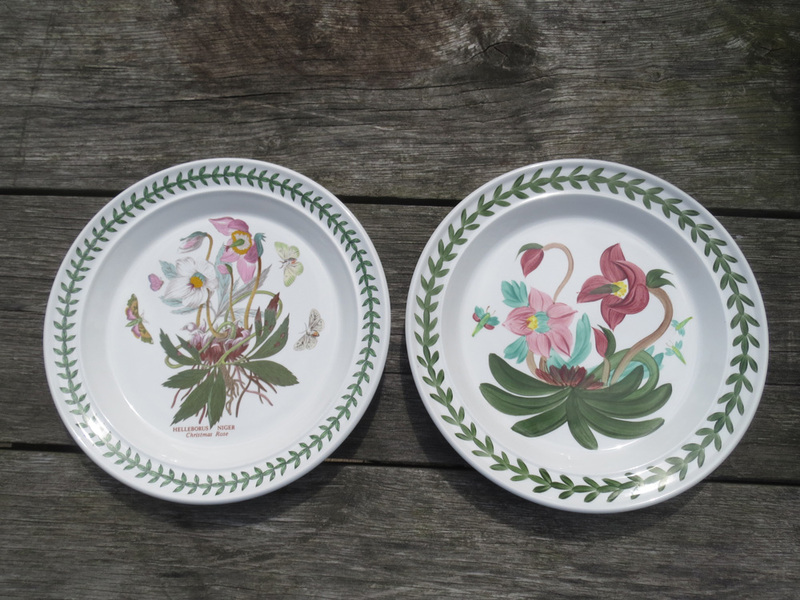 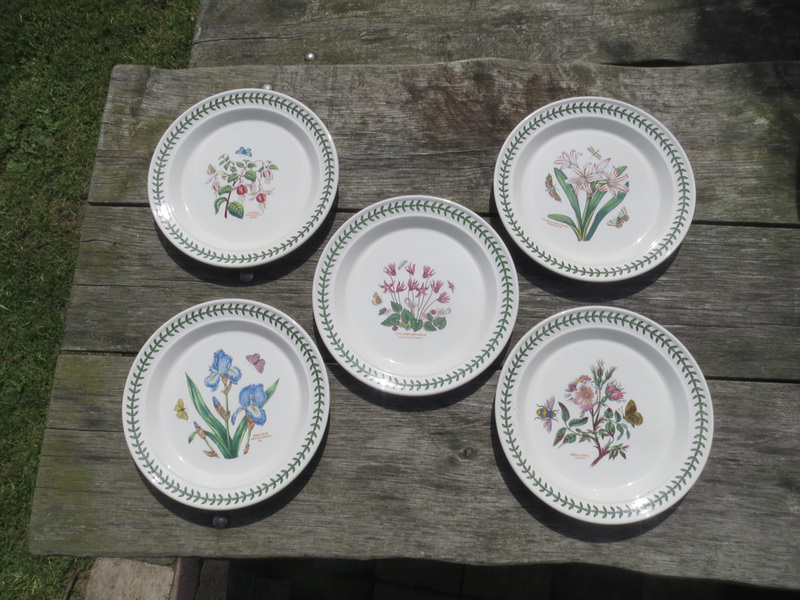 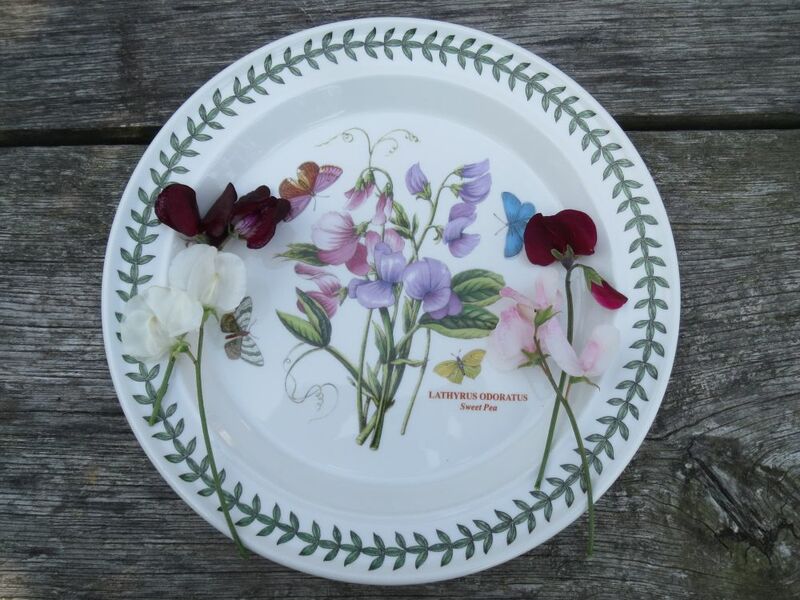 At Portmeirion they are very good at what-iffing, here are some trials with salad plate motifs on dinner plates, the Fuchsia, Ivy Leafed Cyclamen, Belladonna Lily, Blue Iris and Dog Rose. 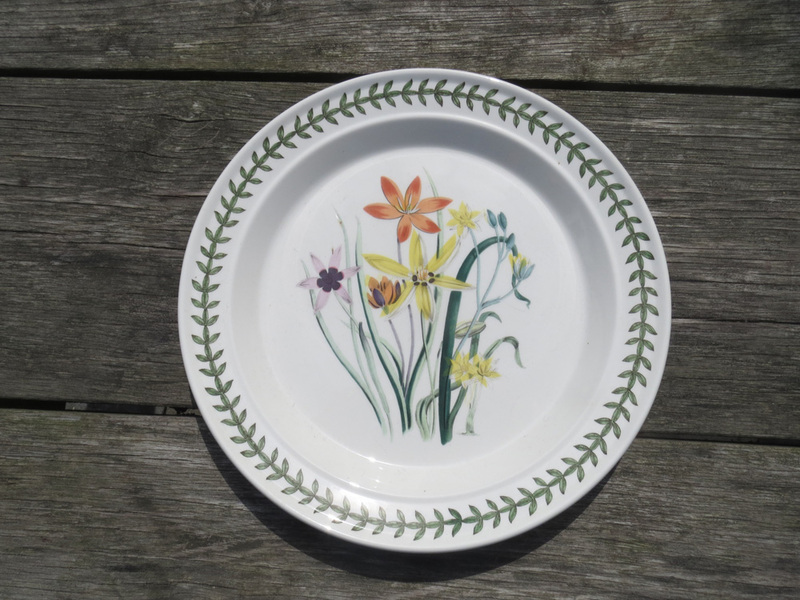 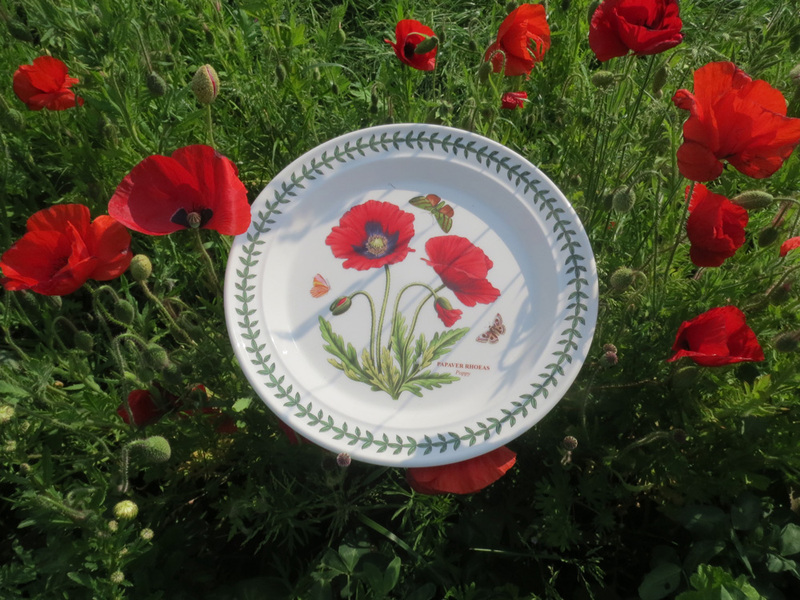 When Susan Williams-Ellis died in 2007 the company honoured her life with the return of one of the earlier motifs, the Meadow Saffron, on a dinner plate. 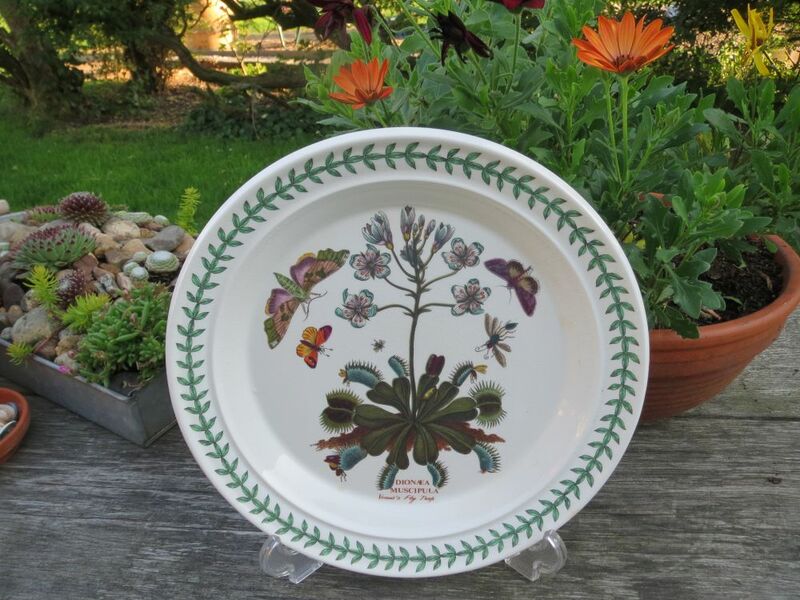 Here is a rare dinnerplate withe the Botanic Garden border and a Ladies Flower Garden motif. 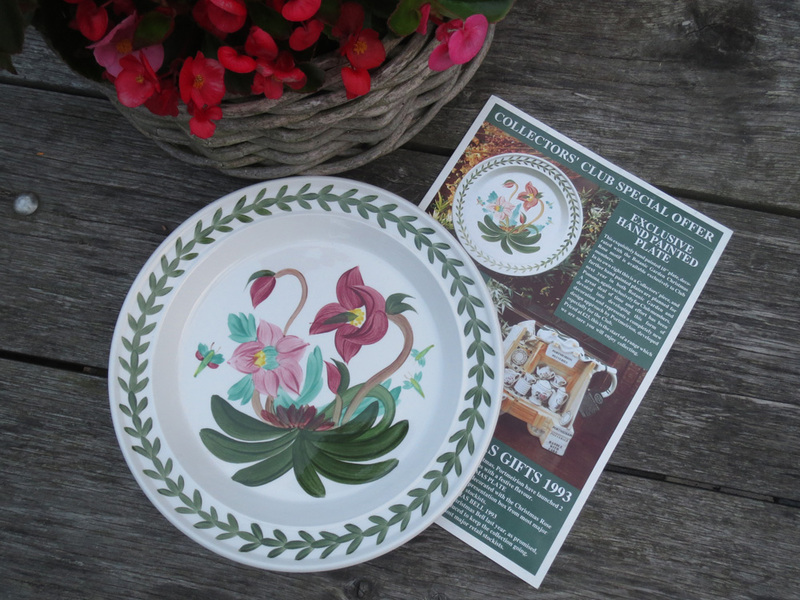 The Collectors Club was presented with a hand-painted version of the Christmas Rose in 1993. 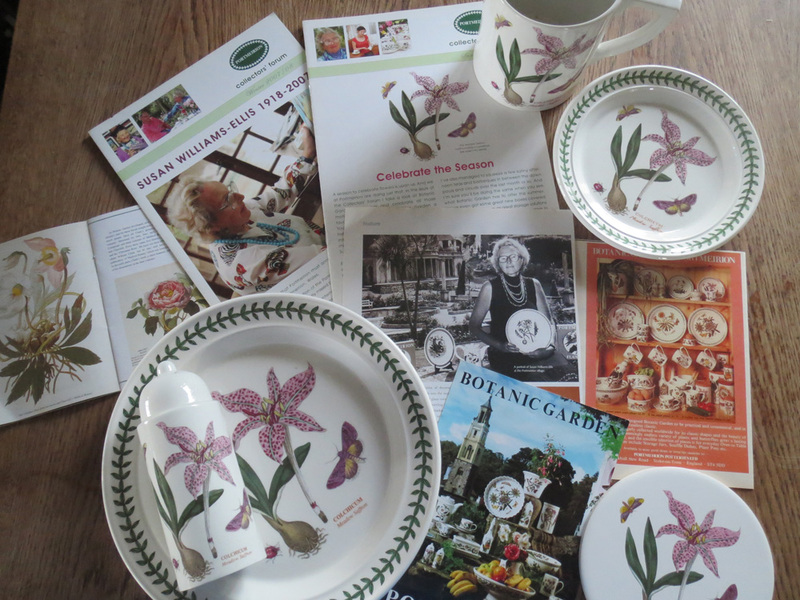 There is no longer a collectors club now, and no new Collectors Letters have appeared for a long time, which is a pity. 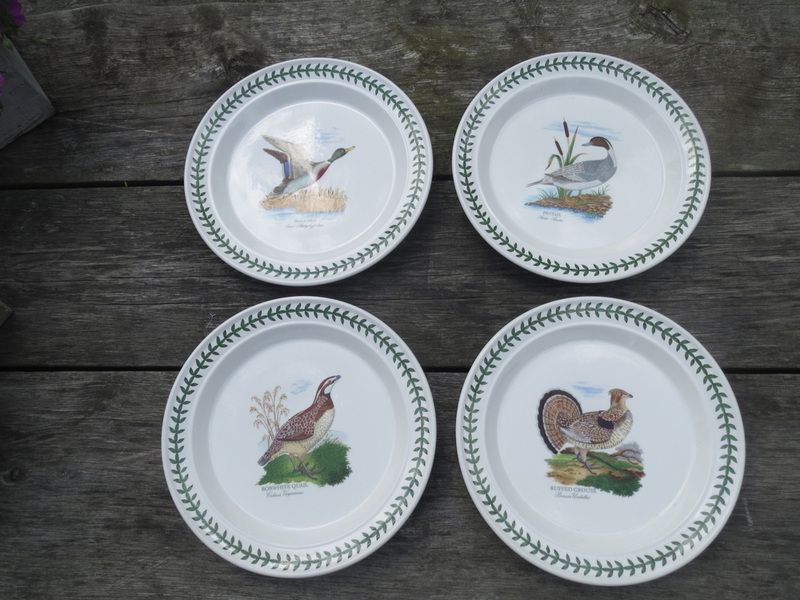 They are the Mallard, the Pintail, the Bobwhite Quail and the Ruffed Grouse. 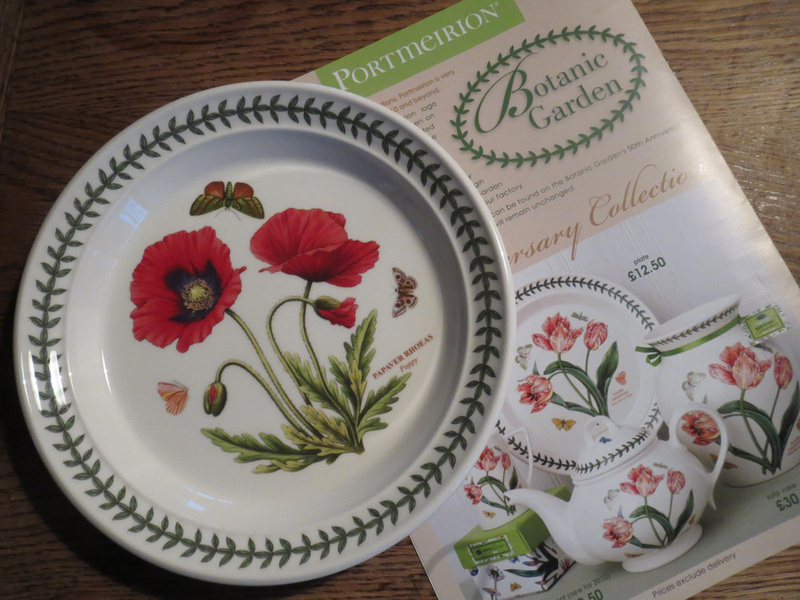 I am not quite sure whether the Botanic Birds are part of the Botanic Garden range, or whether they should be classified as Birds of Britain. 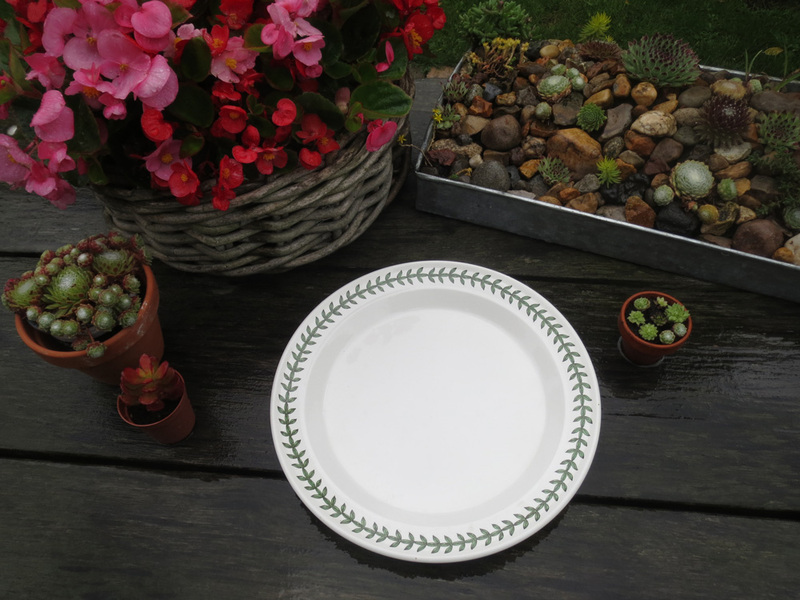 Anyway, I put the dinner plates here. 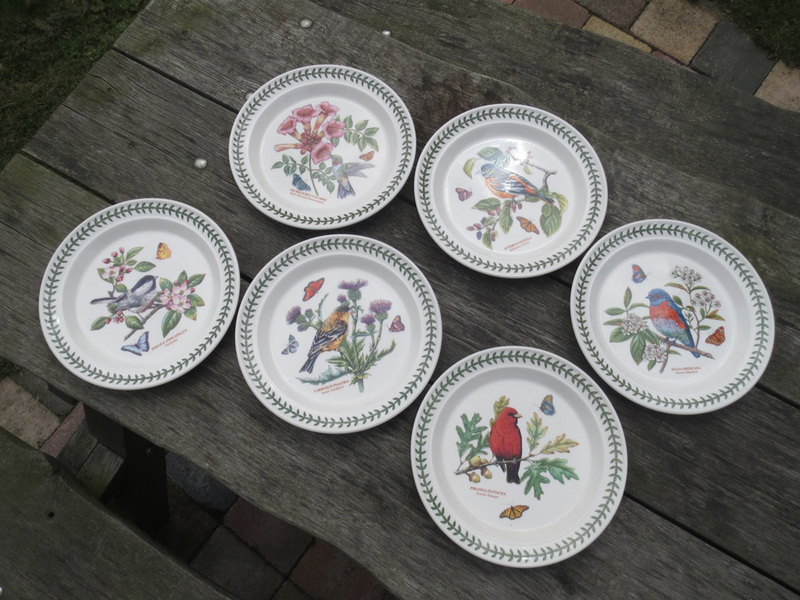 They are the Ruby-Throated Hummingbird, Baltimore Oriole, Chickadee, Lesser Goldfinch, Western Bluebird, and Scarlet Tanager. 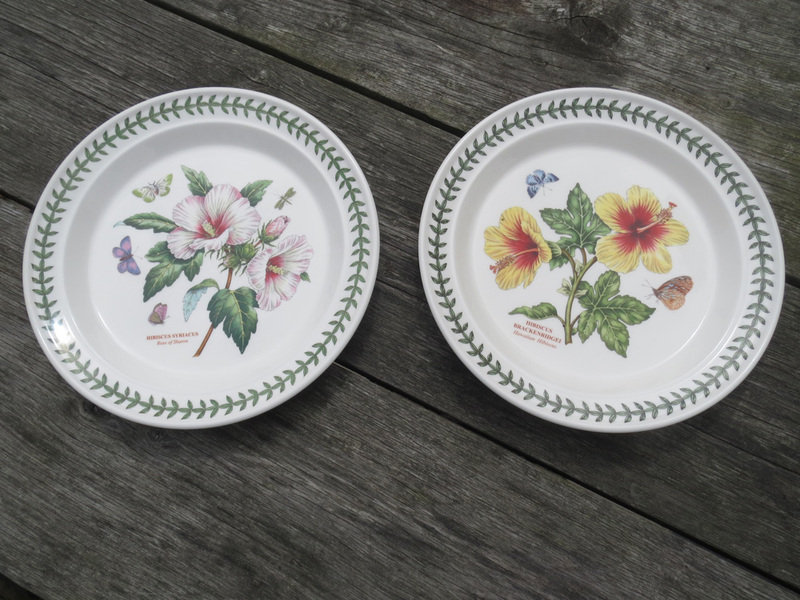 Lovely birds, on dinnerplates with the Botanic Garden Border. 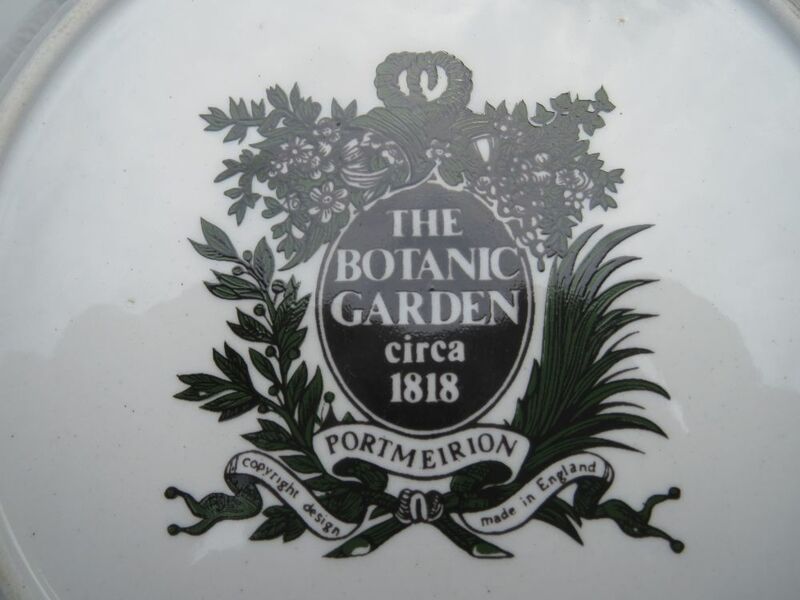 Here is a promotional picture by Portmeirion. 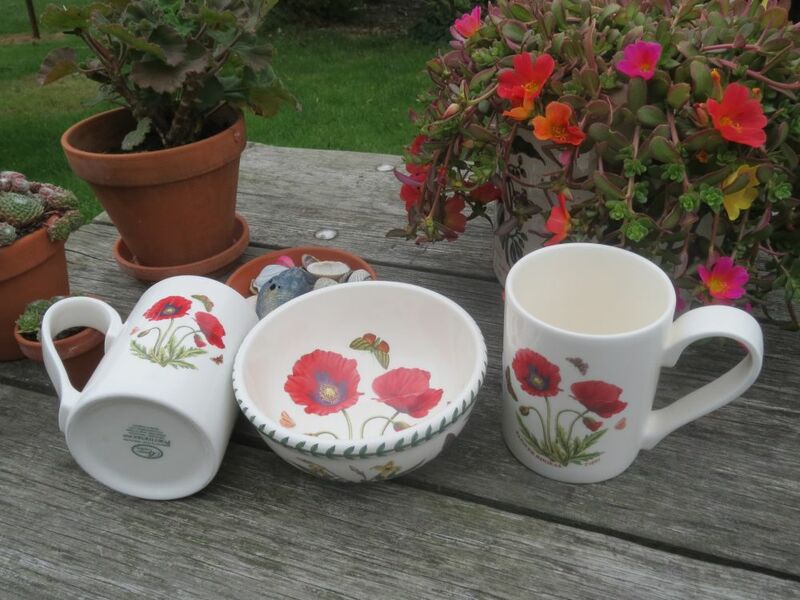 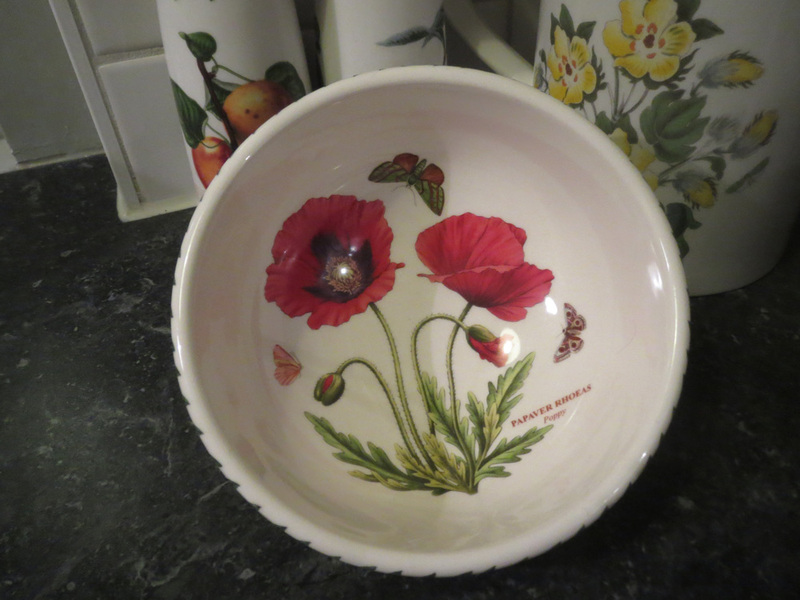 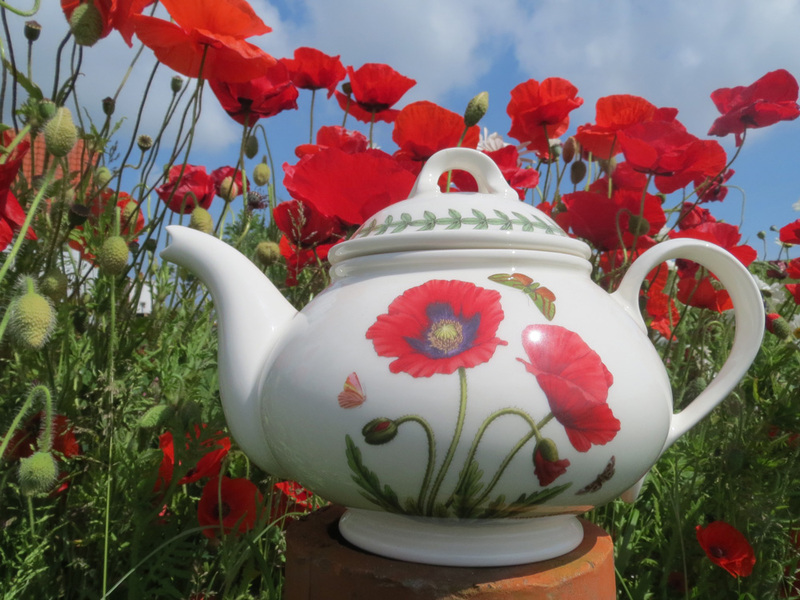 Unfortunately, unlike the small teapot, the salad bowls are not available in the Poppy motif. 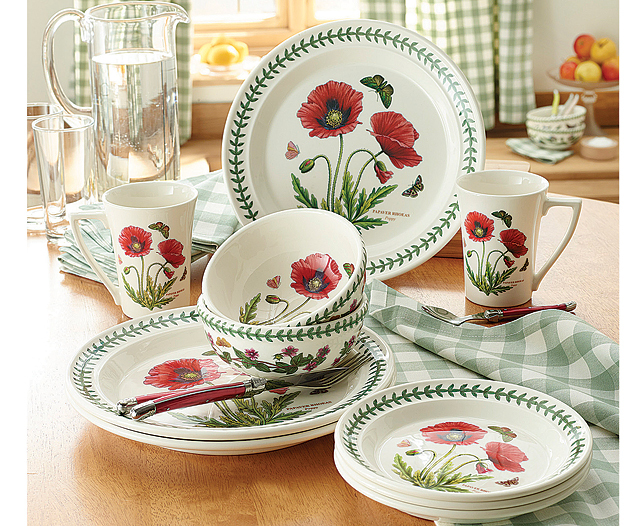 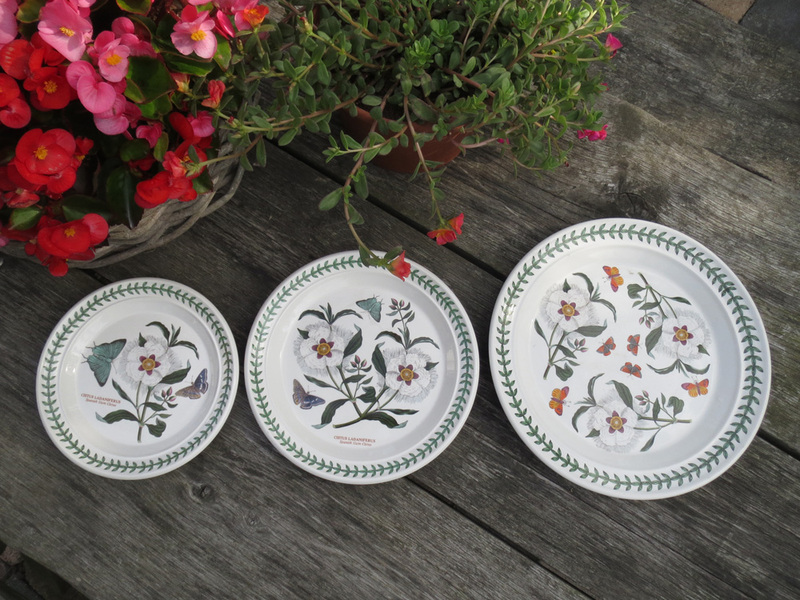 The Botanic Garden range has a new motif, the Arborea.